"A proposition to give our money, accompanied with large fleets and armies, seems addressed to our fears, rather than to our freedom.... can the world be deceived into an opinion that we are unreasonable, or can it hesitate to believe with us, that nothing but our own exertions may defeat the ministerial sentence of death or abject submission." CONTINENTAL CONGRESS. [THOMAS JEFFERSON]. Newspaper. Rivington's New York Gazetteer, August 10, 1775, printing of the Congressional Resolution of July 31, 1775, rejecting Lord North's Conciliatory Proposal that attempted to divide the colonies and weaken the move towards independence. Signed in type by John Hancock. The Resolution was drafted by Thomas Jefferson, for a committee including Benjamin Franklin, John Adams, and Richard Henry Lee. 4 pp. 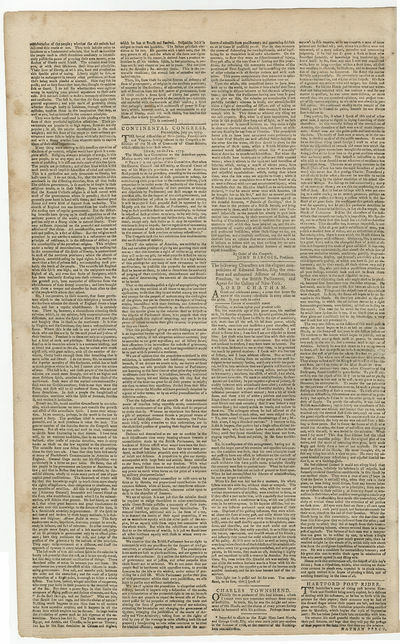 "The Congress took the said resolution into consideration, and are thereupon of opinion, THAT the colonies of America, are entitled to the sole and exclusive privilege of giving and granting their own money… and that it is a high breach of this privilege for any body of men, extraneous to their constitutions, to prescribe the purposes for which money shall be levied on them, to take to themselves the authority of judging of their conditions, circumstances and situations; and of determining the amount of the contribution to be levied." "That as the colonies possess a right of appropriating their gifts, so are they entitled … to see that they be not wasted among the venal and corrupt for the purpose of undermining the civil rights of the givers, nor yet be diverted to the support of standing armies, inconsistent with their freedom, and subversive of their quiet." "We are of opinion the proposition is altogether unsatisfactory, because it imports only a suspension of the mode, not a renunciation of the pretended right to tax us: because too it does not propose to repeal the several acts of Parliament passed for the purposes of restraining the trade and altering the form of government of one of our colonies; extending the boundaries and changing the government of Quebec; enlarging the jurisdiction of the Courts of Admiralty and Vice-Admiralty; taking from us the rights of trial by jury of the vicinage in cases affecting both life and property; transporting us into other countries to be tried for criminal offences; exempting by mock-trial the murderers of colonists from punishment; and quartering soldiers on us in times of profound peace. Nor do they renounce the power of suspending our own legislatures, and of legislating for us themselves in all cases whatsoever." In January 1775, Parliament considered petitions opposing the Coercive Acts (known in America as the Intolerable Acts). On February 20, Prime Minister Lord North laid before the House of Commons a "conciliatory resolution" proposing that any colony that provided support for the British military and civil government would pay no taxes or duties except those necessary to regulate commerce. Parliament passed the resolution a week later. Nova Scotia accepted North's resolution, but most colonies treated it with hostility. In May 1775, the assemblies of New Jersey, Pennsylvania, and Virginia forwarded the resolution to the Second Continental Congress meeting in Philadelphia to represent the American Colonies jointly. Meanwhile on June 17, British forces in Boston conducted a series of attacks on American forces fortified on Bunker Hill and Breed's Hill on the Charlestown Peninsula north of Boston. Although the British assault was successful, they incurred heavy casualties and became more cautious. The American militia demonstrated that they could engage regular army troops, and their performance boosted American morale and strengthened their resolve for independence. On July 22, Congress appointed a committee consisting of Thomas Jefferson, Benjamin Franklin, John Adams, and Richard Henry Lee to consider and report on Lord North's "conciliatory resolution." Jefferson had already written a similar report for the Virginia House of Burgesses, so he was able to present his draft to the committee three days later. Franklin added language explicitly opposing Parliament's assumption of the right to alter colonial charters and laws before the committee submitted the report to Congress, which made minor changes and approved it on July 31, 1775.
laid out for the delegates to the First Continental Congress a set of grievances charged against King George III and Parliament. Nearly a year later, Jefferson authored the "Virginia Resolutions on Lord North's Conciliatory Proposal," which the Virginia House of Burgesses unanimously passed on June 10. Jefferson then departed to join the Second Continental Congress, arriving on June 20. On June 23, 1775, Congress appointed a committee to write a Declaration of Causes to be published when George Washington arrived on the outskirts of Boston to assume command of the Continental Army. After Congress debated and recommitted John Rutledge's draft and added John Dickinson and Jefferson to the committee, Jefferson wrote a new draft, which Dickinson revised to entertain some room for reconciliation with Britain. On July 6, 1775, Congress approved Jefferson and Dickinson's "Declaration of the Causes and Necessity of Taking Up Arms." Jefferson then turned his attention to developing this response to Lord North's proposal. Thomas Jefferson (1743-1826) was born in Virginia and graduated from the College of William and Mary in 1762. He read law and was admitted to the Virginia bar in 1767. He served as a delegate to the Virginia House of Burgesses from 1769 to 1775. Between 1774 and 1776, he wrote a series of political manifestos asserting American rights, including A Summary View of the Rights of British America (July 1774), "Declaration of the Causes and Necessity of Taking Up Arms" (July 1775), and Resolutions of Congress on Lord North's Conciliatory Proposal (July 1775). As a delegate to the Second Continental Congress, Jefferson was the primary author of the Declaration of Independence for the Continental Congress and served as Virginia's governor from 1779 to 1781. From 1785 to 1789, he was the U.S. minister to France, and soon after he returned, President George Washington named Jefferson as the first Secretary of State, a position he held until his resignation at the end of 1793. He lost the 1796 presidential election to John Adams but became Adams' vice-president. In 1800, voters elected him as the third President of the United States, and he served two terms from 1801 to 1809. As president, he oversaw the Louisiana Purchase from France, which nearly doubled the size of the United States. To explore the new territory, he appointed Meriwether Lewis and William Clark to lead the Corps of Discovery (1803-1806). His administration's foreign policy was marked by the successful First Barbary War (1801-1805) and the very unsuccessful Embargo of 1807, designed to punish Great Britain and France for violations of American neutrality. The effort failed, and Jefferson singed the repeal of the Embargo just days before leaving office. After retiring to his home of Monticello, Jefferson founded the University of Virginia in 1819. Like his friend and rival John Adams, Jefferson died on July 4, 1826, the fiftieth anniversary of the Declaration of Independence.